There are four different dinos: a stegosaurus, triceratops, brachiosaurus and tyrannosaurus rex. Knit these with any aran weight yarn – we love the striped dinosaurs that are knit with Noro Kureyon. They range in height from 6″ to 10″ seated, the perfect size for little hands. Again there are four different creatures: an elephant, lion, zebra and giraffe. Use any aran weight yarn for these as well. The safari friends range in height from 8″ to 10″. This is a classic raglan crewneck with a lovely checked texture. It’s a relaxed, oversize fit that’s practical for both comfort and growing room. Any DK weight yarn will work for this one. Valerie has already started one of these shawls. 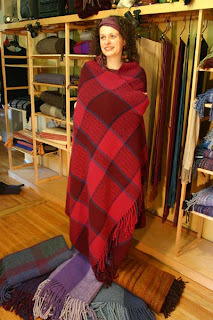 It’s a modular sampler wrap that has a beautiful assortment of colours and textures. This is one of KaK’s most popular designs. 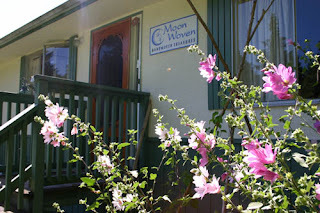 Look here for lots more fantastic Knitting at Knoon designs. We have many of these including the Li’l Sunhats, Sweet Pea and Wee-One Welcome Set for babies, Spanky for kids and Our Gang, Shizuka and The Lucy for women. And we’re happy to special order any other patterns that catch your eye. You should also have a look at the KaK free designs. We think the Mitered Squares Afghan that’s knit in Noro Silk Garden is stunning. And we’ve conveniently just received many new colours of Silk Garden. We’re thinking of scheduling a mitered squares workshop – please call us if you’re interested. This is a magical technique that can easily be mastered by a determined beginner. And speaking of Noro, the intriguing new Kureyon sock yarn should arrive any day. We adore all the Noro yarns and we’re looking forward to expanding our collection! Beautiful new cotton-candy colourways. Ooh that angora is sooo seductive. The rich, jewel tones and textures of these skeins are incredibly appealing. And we’ve added many other new kits to our Fleece Artist wall today. It’s absolutely bursting with luscious colours and textures. This really is art, pure and simple. 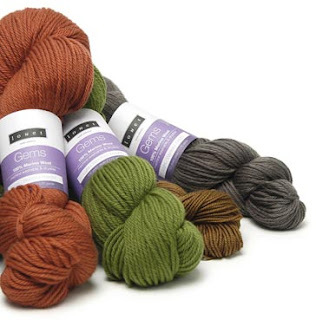 Our special yarn this week is the luxurious RYC Cashmere Tweed at 50% off the regular price. Indulge yourself with this sumptuous mix of 90% cashmere and 10% silk. It’s a velvety soft yarn with a beautiful tweedy texture. Well our 2008 inventory count is pretty much done. Anina is the official “Inventory Queen” having logged over 12 hours in Point Grey on Wednesday and countless additional hours in Edgemont. She’s about to head off to cruise around the Caribbean so she’ll soon get some well-deserved R & R.
We drank too much coffee, ate too many cookies (at least I did) and counted way too much yarn. But the good thing is that with inventory now behind us we can unpack tons of boxes of exciting new products. This is a fantastic yarn with excellent stitch definition. It’s spun with a tight twist to minimize pilling while maintaining a high elasticity. It knits to a gauge of 5 – 6 stitches per inch on 3.25m – 3.75m needles. And best of all, it’s machine washable and dryable. We also have the Louet Euroflax sportweight that’s 100% linen. This is one of the best quality linen yarns available. The yarn is double-boiled and steam processed to ensure maximum softness. It knits to a gauge of 6 stitches per inch on 2.75m – 3.5m needles. It’s also machine washable and dryable. We have an extensive colour assortment of both Euroflax and Gems. We think these Louet yarns will be a popular addition to our collection. Drop by and have a look! 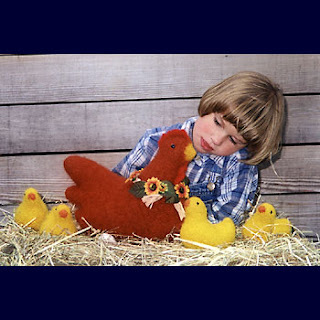 Each kit has a pattern and enough yarn to knit the six eggs and a basket. There are also single egg kits. 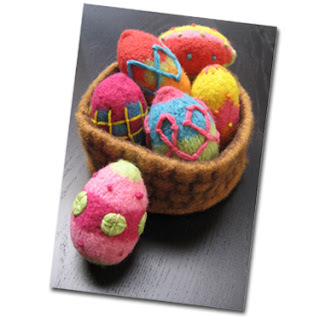 These would be fabulous, colourful Easter decorations. Love the matching dress with a heart on it. You’ll need two balls of Baby Cashmerino and it will be finished in no time. What a great Easter gift! It’s a Fiber Trends pattern that’s knit with worsted weight yarn. Apparently “Henrietta” can be used as a doorstop with some weight added to her stuffing. Looking for Tuesday specials? We’ll start those again next week. In the meantime, check out all of our current specials right here. And don’t forget, we’ll be closed to count our inventory in Point Grey tomorrow, February 20. Ugh. We’ve seen some fabulous hats lately. Hats are such great projects – everyone needs one (or more) and they’re usually quick to finish. It’s Wendy Bernard’s “Le Slouch” design. Jenny can’t remember exactly which yarn she used but we think Rowan’s Scottish Tweed Aran would work well for this one. Sheila worked in our Point Grey store until about a year ago when she left to become a busy full-time mom. This hat is a great design for kids. The built in scarf not only keeps the neck warm but also keeps the hat on the head. It’s knit in one piece with very little finishing. Sheila can’t remember which yarn she used but the pattern calls for a 16 stitch gauge in stockinette stitch. Try using Gedifra Living, single-stranded. Or knit two strands of a DK weight yarn together, as suggested in the pattern. It would be a great stash-buster! There are little bits of many different yarns used in that hat. And if like me, you’re a member of the Jared Flood fan club, you’ve probably seen his latest hats. The gorgeous yellow hat with earflaps is an adaptation of the Thorpe pattern. It looks like a great design, knit from the top down with abundant colour options. And check out Jared’s second hat that’s knit with Silk Garden and Cascade 220. Love the shape, love the colours. Once again, Jared’s creations are simply stunning. It’s the Yarn Harlot’s Unoriginal Hat, knit with BSA Duotones. It’s a size XL, I have to fold up the brim to keep it out of my eyes. But it’s still a pleasure to wear. The yarn is 50% wool, 50% alpaca, which makes it warm, cozy and supersoft. No itchy forehead with this one. I thought I’d finish the hat with two skeins but sadly I had to use about 10% of a third skein for the last few rows. Rowan Big Wool or Ribbon Twist should work well for this design. And if you want an uber-original, edgy hat that would be great for cold days skiing or boarding, check out the Jackyll & Hide. Too funny. Hats off to all of you creative souls, knitting and crocheting such fantastic creations that never cease to inspire us. Read more about Trish and her passion for nature and fiber right here. And be sure to have a look at her inspiring customer gallery of finished projects. We like to support our talented local artists in their endeavours, especially when the finished products are second to none. Enjoy! That’s Jen on the right. She works in Point Grey on Saturdays. She’s an energetic little dynamo who also works as a corporate candy buyer M-F. She has shelves full of candy in her office and she brings us new treats every week. Thanks for all the snacks, Jen! I spent this morning at a funeral for a friend who passed away a few days ago. The place was packed, he was a well-loved and wonderful man. I shed some tears while reminiscing with his wife and kids, watching his little grandchildren run around the room. Although I felt terribly sad afterwards, one memory brought a smile to my face. It was the thought of the hat I knit him a couple of years ago, not long after he was diagnosed with cancer. He told me he loved the hat, loved the colours, that it was a perfect fit. I think he was quite tickled that I had taken the time to knit something for him. I regret not spending more time with him over the last few months but I’m so glad I knit him that hat. 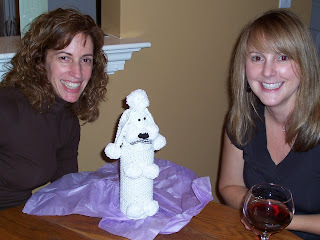 Knit or crochet a gift from the heart for someone you love. You’ll be glad you did. We’ve extended our pre-inventory sale to February 17. Then it’s time for us to start counting everything, ugh. And this year we have two stores to count, double ugh. You can take an extra 10% off all sale items. The complete list is right here. Yup, all those books at 40% off, now you can take 50% off. And that big table that’s chock-a-block full of Blue Sky Alpacas, Ella Rae, Fleece Artist, Louisa Harding and Rowan? Was all 25% off, now it’s 35%. The sale also includes our weekly specials, take an extra 10% off everything on our Specials list. Berroco Candy FX was 70% off, now it’s 80%. You get the idea, I could go on and on but you can read the list yourselves. The kits include a cute little project bag, four skeins of Tofutsies and a CD with ten sock patterns on it. The bag and CD are thrown in for free – it’s a great deal! If you’re looking for some new sock patterns for your Tofutsies, check out these SWTC designs: Tidal Wave, Feet Tart, Dusty Rose and Cutesie. Or have a look at these ‘Through the Loop’ sock patterns: Nasturtium and Rhodie. If you’ve never knit a pair of socks but would like to learn how, sign up for one of our Sock Boot Camps. Learn to knit a sock in just one day! Our next SBC runs on Thursday, February 21, 6-9 p.m., in Point Grey. Or if you’d like to move beyond the sock-knitting basics, sign up for Sivia Harding’s Coriolis Sock Class that starts this Wednesday, February 13, from 7-9 p.m. You’ll learn to knit a very cool new sock design, as well as how to perfectly customize your socks to different sizes.